The union movement played a vital role in securing Kevin Rudd’s election. But the new Labor government’s industrial relations legislation is a slap in the face for unions, keeping most of WorkChoices in place. WorkChoices’ key anti-union measures criminalising basic union organising, such as the restrictions on union right of entry to workplaces and the special laws policing construction unions are set to stay. Yet one year into Rudd’s term in office the union movement has made virtually no effort to force the new government to deliver real change. This failure is a direct result of weaknesses of the union Rights at Work campaign. While it was an effective tool for electing Labor, the opportunity to rebuild unions’ own ability to fight was squandered. We need to learn the lessons in order to organise successfully to get rid of the rest of WorkChoices, as well as the anti-union laws in the construction industry including the ABCC. Opposition to WorkChoices was vital to Kevin Rudd winning last year’s election. It was the union movement, not Kevin Rudd, that was primarily responsible for this. The union campaign against the laws began in 2005—almost three years before the election. As early as August 2005, over 60 per cent of the public said they were opposed to the laws. It combined both a sophisticated media strategy of TV advertising and grassroots activist mobilisation. The grassroots side of the campaign culminated in the campaigning in marginal seats. This was an undoubted success in swinging key marginal seats to Labor. Thousands of unionists and community activists worked to letterbox, petition and campaign against Howard in seats across the country. Unionists everywhere were buoyed by Howard’s crushing election defeat. But the Rights at Work campaign did not increase unions’ own strength to campaign and fight. Total union membership actually fell by 5 per cent, or 89,000, in the year to August 2007, according to Bureau of Statistics data. This reflects that the focus of Your Rights at Work was on organising local community-based campaign groups in key marginal electorates. There were very few examples of workplace-based campaigns, and even those that took place were in the handful of marginal electorates targeted. At the vast majority of workplaces not in marginal electorates unionists were not involved in the campaign. As a result a larger layer of rank-and-file union activists with an understanding of how to continue campaigning either around issues at a workplace level or to pressure Rudd to genuinely scrap WorkChoices was not built. This failure was a result of the lack of any industrial campaign to fight WorkChoices. The Rights at Work campaign began with mass union delegates’ meetings in Victoria and NSW in March and May 2005. They were among the largest and most enthusiastically attended in years. In Melbourne, where the Victorian Trades Hall Council encouraged all unions to mobilise for mass protests, 150,000 hit the streets in June and another 200,000 in November. Across the country 600,000 demonstrated on November 15. Unfortunately senior union leaders and the ACTU only saw the demonstrations as a sideshow to their electoral campaign. Once the government passed the WorkChoices legislation at the end of 2005 the size of the demonstrations declined as the ACTU focussed unions’ efforts on marginal seats. Hundreds of thousands of people left the rallies with a sense of confidence that the campaign could stop Howard’s laws. The success of the mass rallies could have been used to build an escalating campaign of larger and more frequent demonstrations to stop the laws being passed through parliament, or resist their implementation. The Howard government was cautious about provoking a large industrial confrontation with the unions after its failure to break the maritime union in 1998. All along the Workplace Relations Minister Kevin Andrews was at pains not to inflame opposition, repeating statements like “What we’ll do is apply a very cautious and careful approach”. The decline in union density is often held up as a reason unions need to be cautious about taking action. But the mass demonstrations showed how this could be overcome. The biggest contingents were from industries with high levels of unionisation like construction, manufacturing and nursing. But the rallies drew in thousands of workers from poorly organised workplaces—including many who weren’t even union members. They also gave confidence to unionists in workplaces where striking is difficult to defy their bosses and attend the demonstrations. Many employers tried to intimidate workers out of attending. The ABCC Deputy Commissioner even declared construction workers could face individual $22,000 fines for going on strike to attend the rallies. But these threats were ignored in a show of mass defiance of the anti-union laws. By contrast the acceptance by union officials that WorkChoices could not be fought industrially meant enormous damage was done to union organisation after Howard introduced WorkChoices. With WorkChoices in place for two years many union leaders argued that there was nothing unions could do to resist the laws, and that they had to accept the new restrictions on union activity and wait for a Labor victory at the 2007 election. This was particularly damaging in the construction industry, where it meant unions abandoned basic routines of organising such as regular workplace meetings. Some employers took the opportunity to weaken unions by sacking union delegates like Barry Hemsworth, a construction unionist in Sydney. The ACTU’s “community campaign” model drawn from the Rights at Work campaign does not apply so easily when faced with Labor governments in power. Unions cannot campaign to remove Labor MPs in marginal seats when the only alternative is many places is a Liberal. As a result the union leaderships have opted to simply lobby within the Labor Party for changes to government policy. This has meant that there has not been a single mass demonstration nationwide demanding Labor repeal WorkChoices. The limitations of this lobbying can be seen in the legislation that Labor has produced—which as the Financial Review gloated “retain most of the WorkChoices laws rather than abolish them”. The two areas where unions have campaigned more openly against Labor governments since the election—against NSW power privatisation and the ABCC—show the problems with this approach. Unions NSW’s campaign against the state Labor government’s power privatisation plans was spearheaded by John Robertson, a key figure in the Rights at Work campaign. The campaign has seen the unions lead an important fight inside the Labor Party—winning an overwhelming vote against privatisation at the NSW Labor party conference and putting serious pressure on Labor MPs not to vote for a sell off in parliament. But the unions’ victory in forcing the resignations of Morris Iemma and Michael Costa and defeating the original plan to sell the power stations has been squandered. Instead of building on the momentum of the victory the unions scored, John Robertson and other senior union leaders have accepted the sell off of electricity retail as a compromise necessary to hold the Labor party together and give support to the new premier. Robertson has taken a position as a Labor MP in the NSW upper house and his deputy at Unions NSW Matt Thistlewaite has moved into the job of NSW Labor Party State Secretary. As a result their fight to shift the direction of the Labor government has been all but abandoned. The campaign against the ABCC has seen construction unions organise nationwide mass demonstrations calling for the commission’s scrapping. But similar to the Rights at Work rallies, these demonstrations are seen by the union officials as a minor part of a strategy of lobbying Labor MPs. 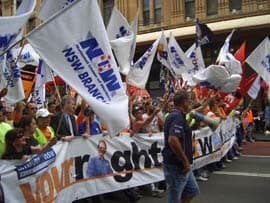 Without the brave decision of Noel Washington to defy the ABCC even these rallies might never have happened, as senior construction union officials have no enthusiasm for a campaign of industrial action in defiance of the commission. Instead they are still agreeing to pay fines imposed by the ABCC, such as a $55,000 fine for taking action to reinstate a sacked apprentice imposed in September. Unions should fight inside the Labor Party for policies that benefit working class people. But the main strength of the union movement is industrial. Union power is based on the ability to organise at a workplace level and to take strike and protest action that can force employers to concede better safety, pay and work conditions. This is a power that can also be mobilised around political demands such as pressuring Labor governments to deliver real change. Disrupting or shutting down workplaces by taking industrial action costs employers money, and forces them to either grant concessions over workplace issues like pay, or to demand the government act to resolve political issues that are causing disruption. But most union leaders have become too afraid of using this power. We need to rebuild networks of rank-and-file unionists across the union movement to push for a serious industrial strategy to campaign for the scrapping of the ABCC, as well as the rest of WorkChoices and to demand an end to policies like privatisation. Without that there is no way we can successfully rebuild the unions and win back our rights at work.